Hi! Have you guessed? I'm writing this post in the friendly skies, on my way to Las Vegas! Skincare is tough, often times, the pits. We are never quite sure what product to buy, try or toss. We try so many different concoctions that it sometimes sends our skin into a tailspin. I was so guilty of not taking proper care of my skin. I was also tired of breakouts and not knowing what products to use. I walked into a Kiehl's store while on vacation, years back. I had no idea where to start, but the staff was so friendly and helpful. They really knew about the products and took time with me to find what would be best for my skin type(combination). Investing in your skincare routine can be expensive. 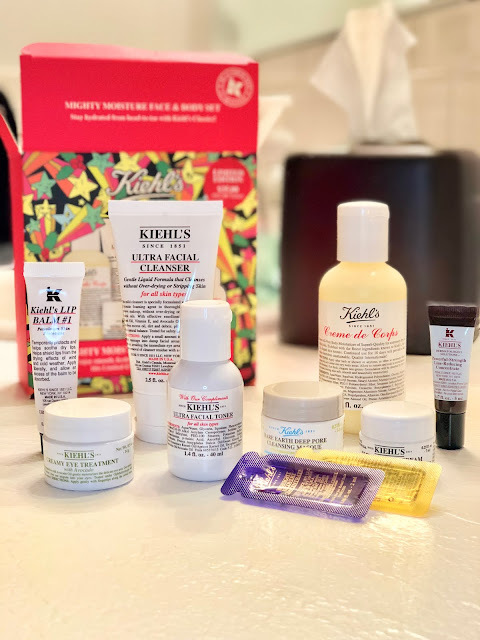 A great way to get started on the right track, and not spend a fortune, is to buy a gift set/starter kit with Kiehl's. Every holiday season they have great gift sets with travel sizes of their best products. I always pick one or two of these up and save them for traveling. They are the perfect size for my carry-on and don't break the bank. Another great option is to buy the 'starter kit'. They have this year round and it also includes their favorite products. Trust me, they are favorites for a reason! 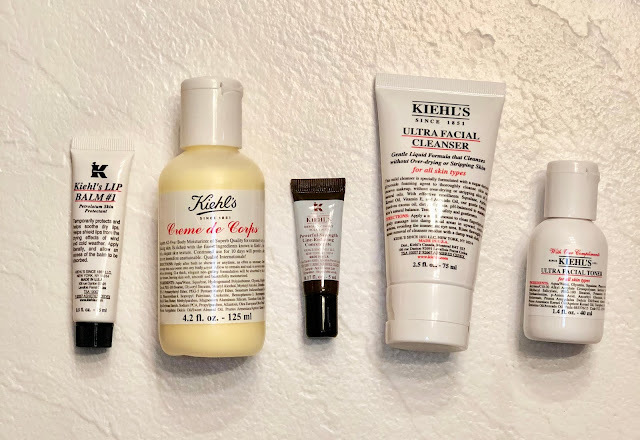 My absolute faves from Kiehl's are the facial wash and facial moisturizer. This stuff evened my skin out and brought it back to a healthy balance. I also use the toner to level my pH balance and the hand moisturizer- which not only smells like Eucalyptus but actually soothes your hands. In the winter months, I swear by creme de' corps, which is an ultra-rich body moisturizer that heals and prevents dry skin. When I'm traveling, my skincare doesn't take a backseat. 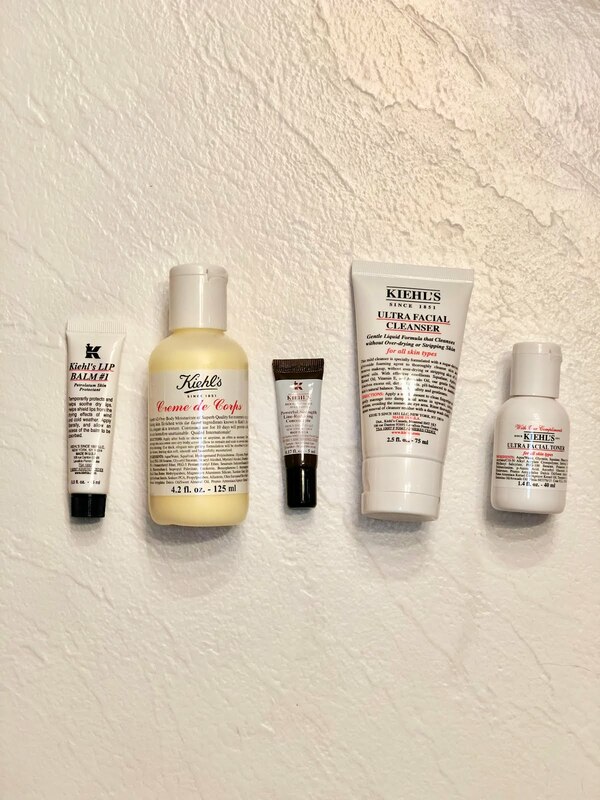 I always bring my travel sizes of Kiehl's with me to keep my skin looking great. 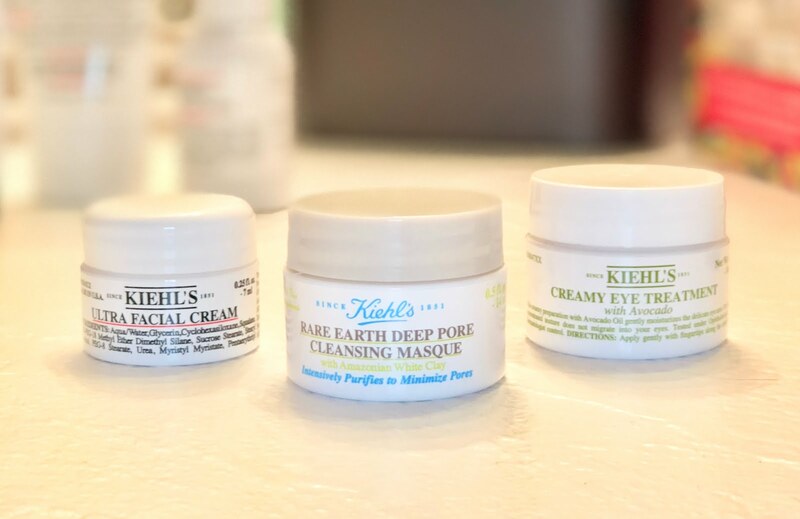 If you've been wanting to start or change your skincare routine, these products are the way to go! This post is not sponsored and contains my honest opinion.